This portal or section is in the process of an expansion or major restructuring. You are welcome to assist in its construction by editing it as well. If this portal has not been edited in several days, please remove this template. The South Australian National Football League, or SANFL (/ˈsænfəl/ or S-A-N-F-L), is an Australian rules football league based in the Australian state of South Australia. It is also the governing body for the sport of Australian rules football in South Australia. Dreamtime at the 'G is an annual Australian rules football match between Australian Football League clubs Essendon and Richmond. Australian rules football is a sport played in over sixty countries around the world. Women's Australian rules football, also known simply as women's football or women's footy, is a form of Australian rules football played by women, generally with some modification to the laws of the game. Note: In order to be recognised as a true national team and not simply expatriates (for the purposes of this entry), the list is subject to International Cup eligibility rules. 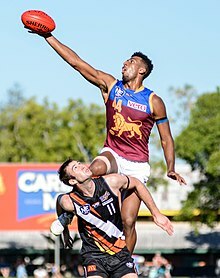 The Northern Territory Football League (NTFL) is an Australian rules football semi-professional league operating in Darwin in the Northern Territory. The Showdown is an Australian rules football local derby game played by the two Australian Football League teams from South Australia, the Adelaide and Port Adelaide football clubs. The head to head count between the two clubs only include premiership matches. The AFL Commission is the official governing body of Australian rules football and the Australian Football League (AFL), the sport's elite national competition. Richard Goyder has been chairman since 4 April 2017, replacing Mike Fitzpatrick. This is a List of Australian rules football families, that is families who have had more than one member play or coach in the Australian Football League (previously the VFL) as well as families who have had multiple immediate family members with notable playing or coaching careers in the West Australian Football League (WAFL), South Australian National Football League (SANFL) or Victorian Football League (VFL, formerly known as the VFA). Each family will have at least a father and child combination or a set of siblings. Many families have had two or more cousins play league football but they are not included unless one also had a father, child or sibling play. The All-Australian team is an all star team of Australian rules footballers, selected by a panel at the end of each season. It represents a complete team, including an interchange bench, of the best performed players during the season, led by that season's premiership coach. Marn Grook or marngrook, from the Woiwurung language for "ball" or "game", is a collective name given the traditional Indigenous Australian football game played at gatherings and celebrations of sometimes more than 100 players. The Australian Football Hall of Fame was established in 1996, the Centenary year of the Australian Football League, to help recognise the contributions made to the sport of Australian rules football by players, umpires, media personalities, coaches and administrators. It was initially established with 136 inductees. As of 2014, this figure has grown to 257, including 27 "Legends". A guernsey is a type of shirt worn by Australian rules football players. It is typically sleeveless, although long sleeves may also be worn. The word "jumper" is also used to describe a guernsey. The AFL Players Association (AFLPA, also referred to as simply AFL Players) is the representative body for all current and past professional Australian Football League players. ... that Australian rules footballer Tom Barrass injured his back while using a dustpan and missed six matches? ... that in 2017, Australian rules footballer Jackson Nelson finished a game against Hawthorn despite breaking his wrist in the second quarter? ... that Sophie Van De Heuvel competed at the national level in both cricket and Australian rules football during her junior career? ... that during the early years of Australian rules football, only Tom Wills was said to be able to match the "pluck and skill" of George O'Mullane as a player? ... that Australian rules football player Ben Cousins co-produced a documentary film depicting his struggle with drug addiction? ... that cricketer and Australian rules footballer George Coulthard was attacked by a shark near Shark Island? Do you have a question about Australian rules football that you can't find the answer to? For editor resources and to collaborate with other editors on improving Wikipedia's Australian rules football-related articles, see WikiProject Australian rules football.